The LoCo Team Directory (LD) is a place where you can find information regarding Ubuntu Local Community (LoCo) Teams; and in a blog post today, Jono Bacon discusses what he is looking forward to discussing about this community maintained resource at the upcoming Ubuntu Developer Summit (UDS). 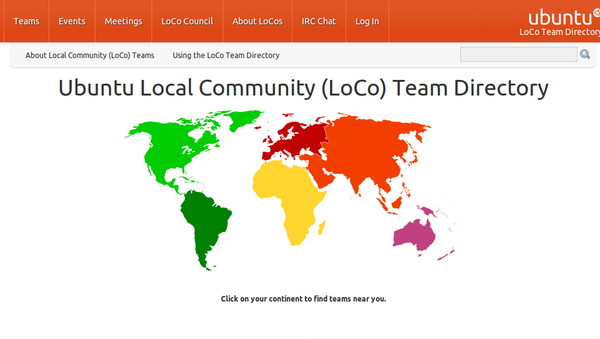 "I love the LoCo Directory," says Bacon "The site provides a fantastic way to browse the global list of Ubuntu LoCo Teams, organize events and more. What is more, it is almost entirely a community-driven project; the site has a series of developers who actively work to improve and refine it." Sessions have already been scheduled for next week at UDS (Ubuntu Developer Summit) regarding the next steps for the LoCo Directory and Bacon says he wanted to share some elements that he thinks would bring "huge value" to the site and the wider Ubuntu LoCo community. Those elements include integrated help, make the LD tab-worthy, and visually depicting the people part of LoCos. Bacon adds that these are some of the ideas he is looking forward to discussing about the LD at UDS, and asks users, "What other ideas do you think could be interesting for the site?" For more information on the LoCo Directory's Next Steps see Bacon's Blog - jonobacon@home. Community. This innocent little word is the lifeblood of Open Source. Barely a day goes by without hearing some mention of community – whether it's in a magazine, a local book club, your closest group of friends, or any one of a million other places.